My name is Lori Johnson. I also have work (short stories & essays) published under the name Lori D. Johnson. After The Dance (Kensington/Dafina) is the title of my debut novel. Interesting question. Most of the short stories I've published would more than likely be considered "literary." I've heard people describe After The Dance as chick-lit, romance and even urban-lit. Personally, I don't think it belongs in any of those categories (smile). I view After The Dance as a humorous, contemporary love story. I was born in Memphis, TN and I am the eldest of two children. Thanks to my father's military career, I spent the first seventeen years of my life living in various parts of the United States and a couple of those seventeen in Wiesbaden Germany. Even though I currently reside in Charlotte, North Carolina with my husband and our young son, Memphis, TN is still the one place I call "home." My love of words dates back to childhood, well before I could even walk or read. 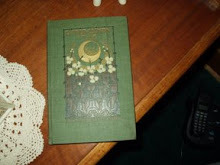 My mother likes to tell the story of how she and other relatives would deliberately hand me books (minus pictures and/or photos) turned upside down. Inevitably, I'd cry until someone turned the book right-side up again. They found it amusing that somehow, instinctively, I seemed to know something wasn't quite right. Even now, I still don't like my words turned upside down (smile). After The Dance is a romantic comedy, set in Memphis, and told from both the male and female perspectives. In the story, thirty-four year old Faye Abrahams, a chain-smoking, cynical pharmacist, describes her efforts to resist the charms of her next door neighbor, Carl Tucker, the forty-two year old, financially-strapped, divorced father of three who appears intent on sweet-talking and slow-dancing his way into Faye's heart. After The Dance should be available in all of the major bookstores, retail outlets and via Amazon. I recently finished my second novel, which is tentatively entitled A Natural Woman. In short, A Natural Woman centers upon a young, single college professor whose relationship with her male hairdresser takes a mysterious turn when he disappears shortly after their first night together. As much as I enjoy making readers laugh, giggle and smile, I'd like to think my humor goes a step beyond "mindless" entertainment. In much the manner of a Paul Mooney or a Whoopie Goldberg, I'm also striving to make folks think, question or if nothing else, simply say, "Hmm." Thanks Peggy for granting me this opportunity to share a bit about myself and my writing with others. Thank you, Lori! We know you'll have great success with this debut offering! Sorry it has been so long since the last post. A great deal has been going on. Wonderful goings on, mind you. We had so much fun at the doll-making workshop at the Culture House Gallery at the University of Missouri-Kansas City on April 5th! About 25 brave doll-makers showed up. Most were beginners, but some were experienced in some form of sewing (design, quilting, etc. ), and the atmosphere was electric with fun and excitement. The workshop presenter was doll artist Nedra Bonds and I have to give it to her. She was phenomenal! The reception was so heart-warming for me. The response to my dolls, from my Wee Be Wee Folks to my Bridge Ladies, from my Windsors to my AllenArt Dolls, shook me! The feedback literally just 'blew me away'. I am so encouraged and motivated now. Plus, I received a few new invitations for more exciting opportunities in the near future as a result of this show. I will of course keep you updated. Make a note, too, that I will be on an artist panel at the Robert Frazier Gallery of Contemporary Art on Thursday, April 17, with a host of extraordinary women artist. 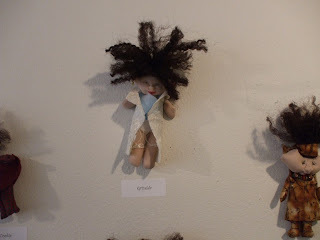 Our works are all currently included in the "She-Art" Exhibition at the Gallery which continues through May 3rd. This lecture/panel is in conjunction with Women in the Arts month and the slated moderator is Sean Kelley. Knowing some of the other artist as I do, the discussion promises to be lively, informative, and provocative! Don't miss it if you are in the city! My biggest problem now is finding time to go to bed. All of this visual arts foreplay heighten my appetite to write, so I'm once again pecking away at my keyboard into the wee hours of the morning. But, the great thing is that I'm springing from bed in the mornings refreshed and invigorated. Looks like art begets art, and I can think of few things that could be better.